Is happiness the secret to success? Often in our fast-paced, modern society, happiness is equated with success. Many of us work incredibly hard in the belief that happiness comes from achieving our goals. But it seems that we might be looking at things back to front. Stanford researcher Emma Seppälä says the evidence suggests it is happiness that leads to success, not the other way round. After working in many high-achieving environments like Yale, Stanford and Silicon Valley, Seppälä noticed the high cost people were paying for success. They were burning themselves out and "postponing" happiness in the belief that they would eventually be happy when they succeeded in their career goals. 2. Write yourself a letter: When your emotions are overwhelming, write a letter to yourself as if you were writing to a friend. It might feel strange at first, but your comforting words will help to normalize the situation rather than blow it out of proportion. 3. Develop a self-compassion phrase: Use a mantra or a phrase that you can turn to in challenging situations, so you can deal with them calmly and with grace. 4. Make a daily gratitude list: Write down five things you feel grateful for every day, or are proud of having accomplished. This may sound overly simplistic, but this extremely short exercise can produce powerful and long-lasting results. Something else which became apparent from Seppälä’s research was the problem caused by our reliance on high-intensity emotions. 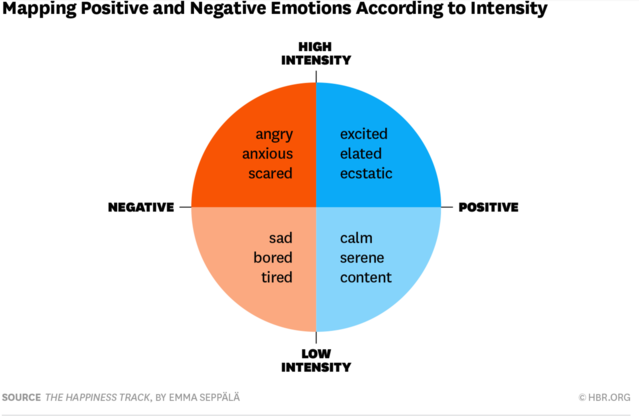 The diagram below shows how both positive and negative emotions can be high or low intensity. Seppälä found that Western culture seems to equate the high-intensity emotions with success whereas in Eastern culture it is more associated with the low-intensity ones. It seems we often rely on stress response to get things done. Adrenaline and caffeine help us switch between the two sides of the high-intensity emotions. Anxiety, anger, excitement and elation – we believe these are the states of mind needed to achieve success. The cost of trying to be “fired up” all the time is significant because it activates the body’s stress response. Excitement can deplete our system when sustained over long periods and chronic stress compromises our immunity, memory and attention span. In other words, high intensity, whether it’s from negative states like anxiety or positive states like excitement, taxes the body and exhausts us. Seppälä recommends making a determined effort to “rest and digest” in order to restore health and well-being and make us more resilient, happy and successful over the long term. How should we really define success?